I had no doubt he was. After all, just a day earlier, Price had proved adept at checking his reflection. During the Skills Competition Breakaway Challenge, as Philadelphia Flyers rookie Sean Couturier skated in on him, Price turned his back NHL 94 on Sega Genesis style and faced the glass, getting enough of a glimpse of Couturier’s move to stop the kid’s shot. All-Star Weekend isn’t the best place for even the best goalies. The game is filled with offensive firepower and lazy, Daria-esque defense; they’re bound to get lit up at some point. And the skills competition focuses not on in-game situational awareness, positioning, discipline, and recovery, but rather … on breakaways. On one-on-ones. On lots and lots of one-on-ones. What’s a goalie to do? The answer, as Pierre McGuire might say, is to go have some fun out there. Price wasn’t the only netminder to mess around and enjoy himself over the course of the weekend — Brian Elliott had some spin moves and between-the-legs postures up his blocker as well, while Henrik Lundqvist terrified Rangers fans with this split on Geno Malkin — but he was the best at it. He Tebowed. He waved his arms. He turned his back. 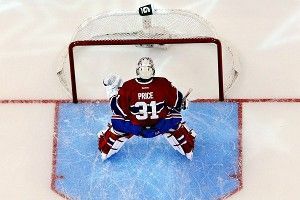 In short, while the focus might have been on Patrick Kane turning into Patrick Kent or Corey Perry reliving his youth, the real winner of the weekend was Price. At 24 years old, the Montreal goalie has already been through an entire career’s worth of pressure, controversy, and intrigue. Two years ago, he split time with Jaroslav Halak in the harsh spotlight of the Canadiens’ net, but it was Halak who became the playoff hero. Still, when the season ended and both players became free agents, Montreal could only afford to keep one. The team opted to make Price their guy, trading Halak to St. Louis (where this year he has been part of one of the strongest goaltending tandems, alongside Elliott.) Price responded with a career season last year, tying Vancouver’s Roberto Luongo in wins with 38 and posting a .923 save percentage. Price is demonstrative in the Patrick Roy mold. He’s brash. He can run just as cold as he does hot. (On Thursday night, he was in net for an embarrassing 5-3 Montreal loss to the Devils in which the Habs allowed New Jersey.) He is, in many ways, the quintessential Montreal goalie, which is not always a good thing, but which has the potential to turn out to be great. When the San Jose Sharks beat the Columbus Blue Jackets 6-0 on Tuesday night, it was the second straight shutout for goaltender Antti Niemi and his fourth of the season. But his 30-save performance was worth a little bit extra: his father, Veikko, was in the stands watching his son play in an NHL game for the first time outside of Europe. (As the Mercury News’ David Pollak reported, his dad went to games in Helsinki and Stockholm when Niemi was there for early season NHL showcases in 2009 and this past fall.) This seems all the more remarkable when you remember that Niemi won a Stanley Cup in 2010 with the Hawks. “He’s not used to flying for a long time,” Niemi told Pollak, “but I thought this was a great opportunity to get him here.” The Sharks’ game in Phoenix this Saturday is the annual team fathers trip, which Veikko will also attend. ProHockeyTalk’s James O’Brien put it best when it comes to the Carolina Hurricanes’ Cam Ward’s play against the Boston Bruins this season: “To most teams, the Boston Bruins are an uncontrollable hockey locomotive. That train seems to hit a wall Wile E. Coyote-style when they face the modest Carolina Hurricanes, however, as their 3-0 shutout gives the lowly team a sweep of the defending champions.” O’Brien notes that Ward has saved 139 of the 144 shots he’s faced against Boston in four games this season. We salute him. Still, though, you have to admit that Lundqvist bailing himself out (with the help of Buffalo’s Brad Boyes, who fails to elevate the puck) during the Rangers’ Wednesday night shootout against the Sabres is pretty fun to watch. Finally, you might recall the video of the Florida Panthers’ young goaltending prospect Jacob Markstrom showing how much He Likes To Party. Puck Daddy brings us a new goalie-dancing video, this one from Russia’s KHL, which takes things a bit lower. I particularly like how goalie Ilya Ezhov inspires that one teammate to start in with some shoulder action. That’s leading by example.